Deep in the French countryside, outside the village of Saché, is the studio and former home of Alexander Calder. France celebrates its cultural heroes -- even non-native ones -- especially when they adopt the country with such obvious affection. 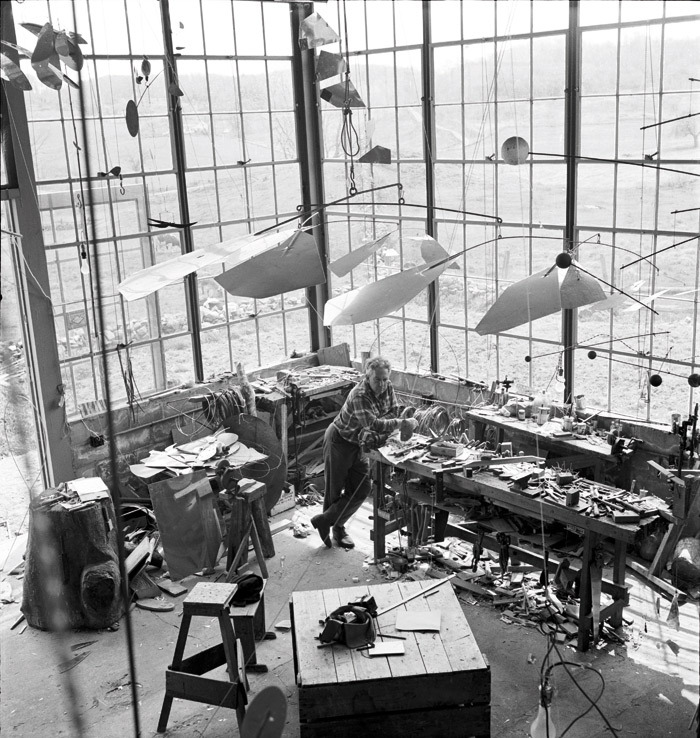 He spent much of his young adulthood and the later part of his life here, working on many of his most iconic large-scale metal sculptures in Saché for months at a time, keeping the local foundry busy and throwing vast parties in the barn-like house and studio he built on the hill above the village. 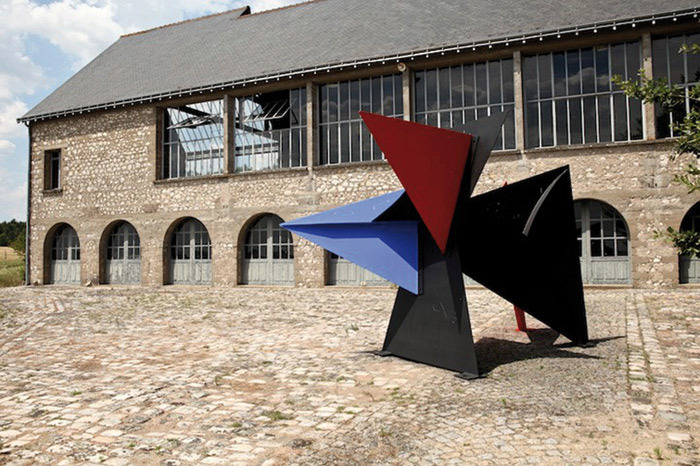 In return, it has named the village square after him -- Place Alexander Calder -- and at the heart of this square stands his Totem sculpture, two orbs on a sturdy metal pole balanced either side of a tall, steel triangle. Classic Calder: spiky, constructed as much of air as of matter; conjuring geometric choreographies and plunging each shape into a delicious tension with the others as well as its surroundings. In the UK Calder has, in the past few decades, had a lower profile than many of his mid-20th-century art world peers, though his delicate mobiles have been an iconic staple of Tate Modern's shop ever since it opened in 1999 -- bringing contemporary art into the bedrooms of a whole generation of children born in the following years. The current Tate Modern show is undoubtedly going to change all that. Alexander Calder: Performing Sculpture (until 3 April) is the largest-ever UK exhibition of Calder's work. It brings together around 100 pieces, from the figurative wire portraits of the Twenties when he hung out with Paris's bohemian elite, to the mobiles he started creating in the Thirties. He influenced and was influenced by so many of the century's leading artists and architects, was friends with Le Corbusier, Fernand Leger and Marcel Duchamp, and seemed to move seamlessly across the disciplines of art, design, engineering and architecture, designing and building his own remarkable homes and studios both in France and the USA, plus most of the furniture in them, from tables to lights. 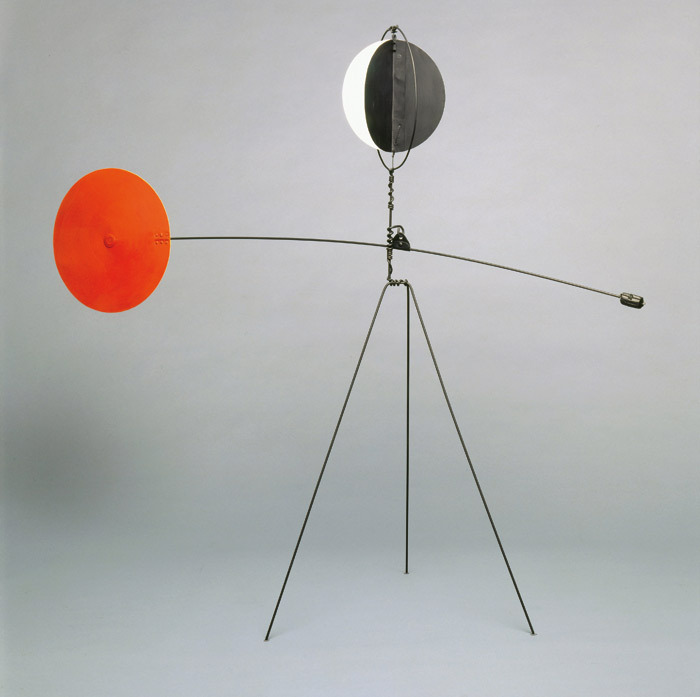 It was Duchamp who first coined the term 'mobiles', for Calder's then motorised objects. And on a visit to Piet Mondrian's studio, in 1930, he was inspired by the idea of creating a whole artistic environment as installation. In this way, his approach and his style -- curious, experimental, multidisciplinary -- seem so thoroughly modern. 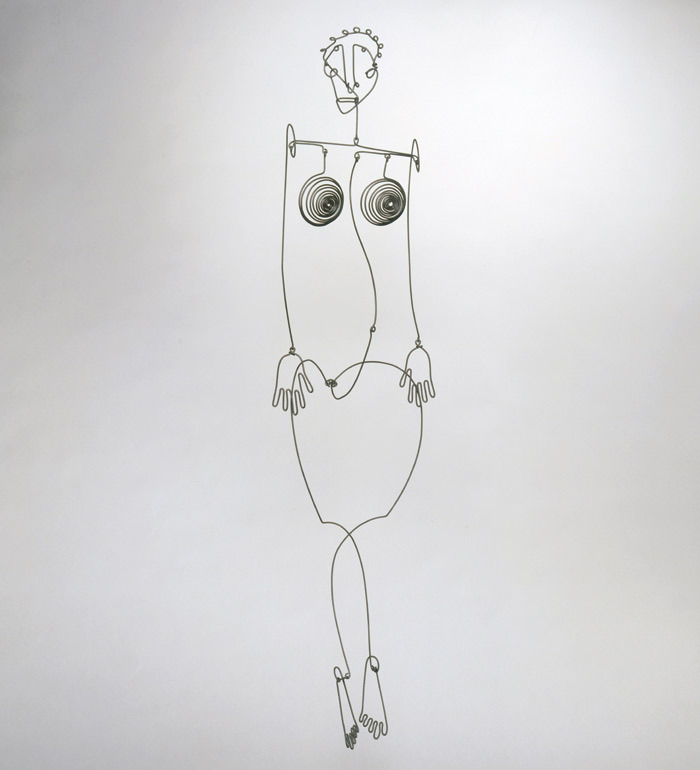 Trained as an engineer, then as a painter, Calder was excited by movement and light, colour and texture -- famously drawing inspiration from circus acrobats (and the drama of the object/person in the spotlight) as well as the sensuous, liberated choreography of modern dance and cabaret; Josephine Baker was a particular muse. He was a pioneer (though not the inventor) of kinetic art, making full use of his training as an engineer in the delicate adjustments of hoists, weights and balances that made his mobiles possible -- not to forget the hours he spent in the Big Top observing circus performers' manoeuvres with ropes and pulleys. You almost get the feeling that the process of experimentation and discovery was more exciting to him than the thing that resulted. And he also refused to be tied down to a definition for his work -- an 'illuminating engineer' was how he described himself in a letter to an eminent art collector in the Thirties. He took great pleasure in orchestrating whole galleries of his mobiles in order to achieve the most interesting interplay between them and the audience, sometimes painting gallery walls dark so that a spotlight could cast the most theatrical impact over the works in that space. And the responsiveness of these mobiles -- their transformation through the lightest puff of air as well as the shift in perspective afforded the viewer as they move around or under them -- makes them precursors of the kind of immersive art that currently populates many a fashionable art gallery, without resorting to superfluous audio-visual reinforcements. He even worked with dancers and musicians, collaborating on musical pieces that could be played alongside an orchestra. In this way, he was doing in the Fifties and Sixties what artists and designers -- and increasingly architects -- have only really allowed themselves to do in the past few years: designing without boundaries. It's hard to know what's more mystifying -- that such a thoroughly modern kind of artist, engineer and designer could have spent decades out of the limelight, or that it's taken almost 50 years for the worlds of art, design and architecture to rediscover the exhilaration of casting narrow notions of what their practices might be to one side and simply engage in the joy of experimenting, collaborating and making. But one thing seems certain: a trip to Tate Modern this winter will help recharge the batteries of any creative who might be feeling stuck in a rut.